When it comes to owners marks and other flaws in tools, I find people fall into two camps. They sand and paint everything until it looks new or they touch as little as they can to preserve it. I tend to fall into the latter, focusing on just what’s needed to preserve, but not alter the look. You find some owners marks are done with great care while others are hastily burned in. As someone who restores saws, I don’t love them all but unless they hamper use they stay. In the process of collecting and buying I ask about names and marks and every once in a while you get a surprise. Such is the case with this S. L. Allen mark found on this early 1900’s Disston D-8. 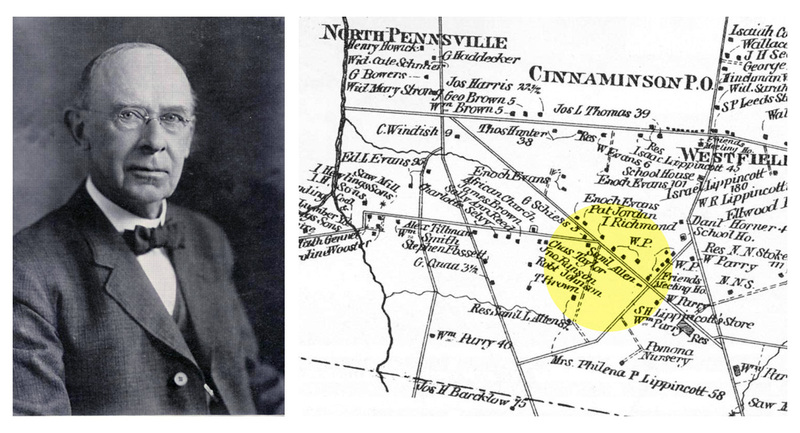 I credit the connection to the current owner and collector of farm implementation made by S. L. Allen Co.
Samuel Leeds Allen and the formation of Moorestown. Although there were property owners as early as 1680 the Village wasn’t founded until 1682. Not recognizing the name I did a little digging and realized although the name wasn’t familiar we’ve cosmically crossed paths for years. Samuel Leeds Allen was born in Philadelphia went to Westtown School It was there he developed a love for Sledding, or “coasting” as it was commonly called. He went on to graduate from Friends Select and founded the S.L. 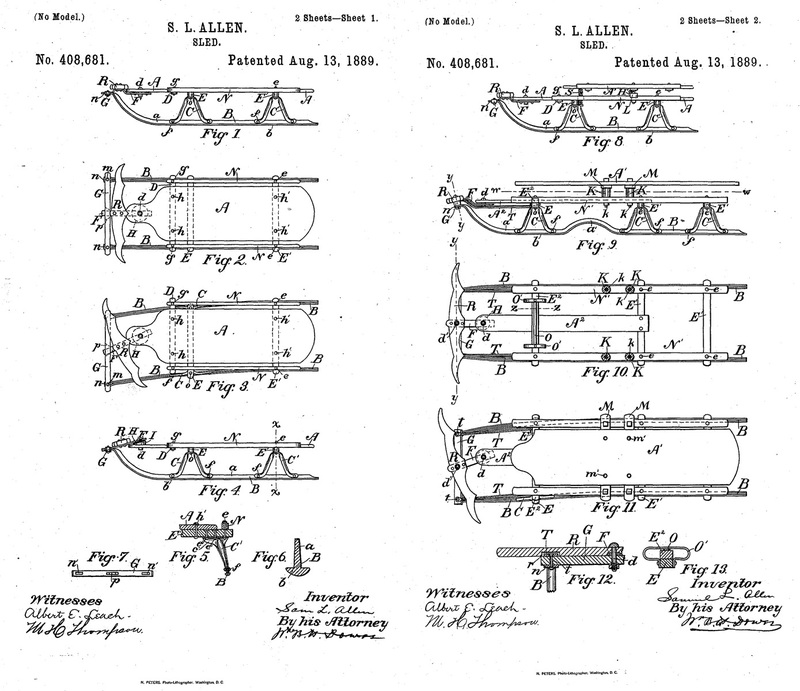 Allen Co. in Moorestown, N.J. to manufacture agricultural machinery. The Allen home built in 1841 named “Breidenhart” which means “broad hearth stone” or “hospitality.” The gardens were laidout by Charles Miller the designer of Fairmount Park. Breidenhart Castle was purchased in 1920 by Eldridge R. Johnson, inventor of the Victor Talking Machine. Raised Quaker his future marriage was held at the Moorestown Meeting House, now part of Moorestown Friends School. A school and Meeting House I attended (authors note: under protest) while I attended the school. Samuel patented over 300 pieces of farm equipment that were sold worldwide, however, he’s most famous for the flexible flyer. The story goes the sled was developed in part to a concern over year-round work for his employees. The sled was a side project started while attending Westtown School and finished with help from his daughter at there home “Breidenhart” in Moorestown. The modern “castle” estate was built on property acquired from the Stokes family and hill across the street retained the name “Stokes Hill” and was used both by he and his daughter Elizabeth for sledding, or “coasting” as it was commonly called. Growing up in the 80’s near Stokes Hill, sledding in the winter was top of mind. The minute snow was forecasted, and on snow days the hill was busier then grand central in NYC. Being a tinkerer and love for speed and danger, I tried just about every known object including the hood of a Volkswagen bug and many home made toboggans in the quest for maximum speed. My friends and I, like drag racers, closely guarded our favorite techniques, mine being Johnson’s paste wax. The same paste wax I use on saw plates today! Later in high school it was popular to meet up after dinner when the hill would be frozen over producing it’s fastest runs. I started working at the kitchen in the Lutheran Home, which was just down the street from Stokes hill and who’s administration building I now know was Samuel “Breidenhart” castle. It must have been an impressive stretch of land as today there are over a dozen houses between the hill and home. Although my hobbies and interests have changed, I still ride by the hill when the conditions are right. I see a lot more plastic in kids hands but the flexible flyers are still prevalent. I did see they are still being made in the US by a long time sled manufacturer, Paricon in Mane. So as I pack up the D8 for it’s trip to the west coast my thoughts drift to its possible use and Joy it brought. The saw was made in the early 1900’s and at that time his company’s manufacturing would have moved to it’s final location in Phily. This being about 25 miles from his house in Moorestown and less then 5 miles from the Disston plant located near the Tacony–Palmyra bridge. By today’s standard, that was considered around the corner, however, at the time it was a difficult commute considering the bridge wasn’t built till 1929! This entry was posted in Life + Times, Saw Talk by Joe Federici. Bookmark the permalink. It’s such a small world. All the layers of history are floating around us all the time, if we can only see them. It’s amazing how you’re so bound up with this saw. and why is it clarity seems to come with age. Wow, that’s so cool Joe!